There has been a little discussion of why the UK ‘recovery’ has been poorer than in the US following Adam Posen’s speech (a quick summary of which is here). Adam Posen makes a number of interesting points, particularly regarding bank credit. However some of the discussion has focused on fiscal policy: is greater austerity in the UK part of the explanation? 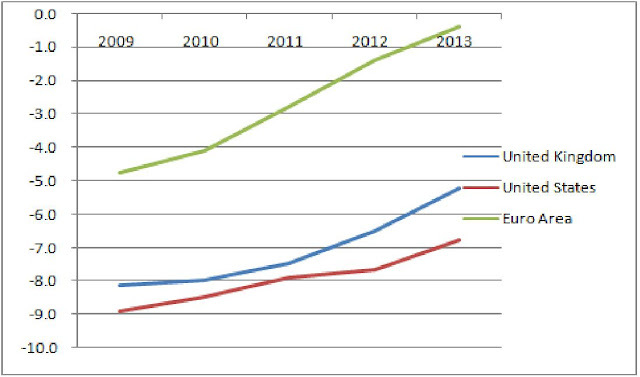 In an earlier post I compared the degree of austerity in the US, UK and Euro area using OECD data, but only by comparing forecasts for 2013 with 2010 outturns. Here is a bit more detail. The broad story is unchanged. All three are tightening policy, but the UK is tightening more than the US, and the Euro area even more. Notice however that on these figures the UK did not tighten more than the US from 2009 to 2011. It is 2012 and 2013 where a clear difference emerges. If we had later years this would probably continue – the underlying deficit is forecast to be in balance in the UK by financial year 2016/7. The lack of divergence from 2009 to 2011 is noted by Ryan Avent here. Does this mean that, looking at the poor performance of the UK relative to the US over the last two years, we can discount the role of fiscal policy? 1) The output gap has been/will be significantly negative for a number of years after 2010, and this gap is not required to restrain inflation. 2) Monetary policy will not close this gap. 3) Fiscal policy has a significant impact on the output gap for given monetary policy. forced the government to adopt additional austerity in 2010 and maintain it subsequently. What we do not require is for poor growth to be mainly due to fiscal policy –the Euro crisis could be more important, for example. It is the counterfactual that matters: output growth would have been significantly stronger as a result of less austerity. Nor is it legitimate to argue that the UK government was unlucky, because of the unexpected severity of the Euro crisis, or higher oil prices, or whatever. Good policy takes account of risks, and what you can do about them. Being at the zero lower bound means that you do not do things that deflate demand unless you believe growth will be strong anyway. If that is what the government believed in 2010 they were foolish indeed. I have talked about the motivations behind austerity before. What I suspect is that one part of the coalition government thought we were about to become like Greece, so (4) did not hold. I can to some extent forgive this given the panic at the time, but they should know better now. And as Jonathan Portes points out, when information changes you should change policy. Believing that (3) is not true is more difficult to forgive. As I continue to be surprised at the number of very good and sensible economists who seem reluctant to acknowledge that fiscal policy matters for demand when monetary policy is constrained, I fear they might have been led astray in part by (selective) advice received. The previous month, the Bank of England reduced interest rates to 0.5%, where they have remained ever since. So a month after interest rates hit the zero lower bound, Osborne gives a speech which included a perfectly sensible account of macroeconomic policy, except when you hit a zero lower bound. So perhaps they were after all ‘very foolish indeed’. These numbers are now a little old, but the most recent OBR forecasts for the UK have hardly changed compared to their November forecast, so for the UK at least these numbers are probably still OK. Odd (that last bit), one can only assume either Osborne was parroting a speech he did not understand, or he fully understands the implications and simply does to want to admit he is wrong and change course. More likely, given civil service timeframes, that the outline of that speech was written before interest rates were dropped. There are implementation lags in rhetoric as well as actions. But it was still very dumb - it was always apparent that the zero bound would be reached in the near future even if they hadn't full arrived yet. What should be in the 2012 Budget? Microfoundations – is there an alternative? What have microfoundations ever done for us?